The reaction cycle of the reconstituted Sox enzyme system of Paracoccus pantotrophus requires the periplasmic proteins SoxYZ, SoxXA, SoxB, and SoxCD. The heme enzyme SoxXA covalently binds the sulfur substrate to the thiol of the single cysteine residue of SoxY located at its carboxy-terminal end. Bound sulfur is then oxidized to sulfate by a series of reactions. These involve sulfur dehydrogenase SoxCD which oxidizes the protein-bound sulfane sulfur to sulfone in a unique six-electron transfer. Bound sulfone is then hydrolyzed off by the sulfate thiohydrolase SoxB to regenerate SoxYZ. 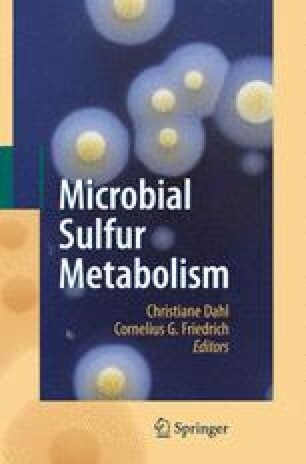 The flavoprotein SoxF enhances the rate of sulfur oxidation in vivo as evident from mutant analysis and we have specified its action in vitro. SoxYZ unlike the other Sox proteins is inactivated upon reduction. When the Sox system is reconstituted with inactivated SoxYZ, the thiosulfate-oxidizing activity is drastically decreased. SoxF reverses this inactivation and may mediate a conformational change of SoxYZ possibly by a transient interprotein disulfide. The membrane protein SoxV and the thioredoxin SoxS are essential for chemotrophic growth as evident from homogenote mutants defective in these proteins. Evidence is presented that both proteins transfer reductant from the cytoplasm to the periplasm and that SoxYZ is the final target of this transfer to balance the redox state of the Sox enzyme system or reduce a SoxY..Y interprotein disulfide.